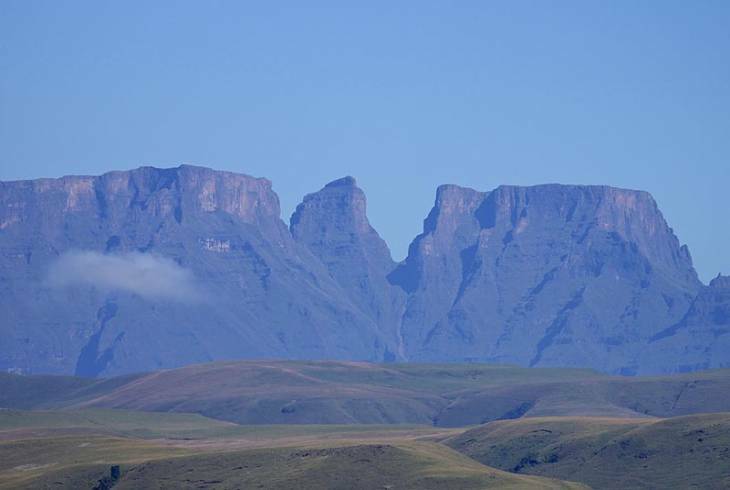 Monk's Cowl is named after the peak located between the towering mountains of Champagne Castle and Cathkin Peak, and makes a portion of the two hundred and forty three thousand hectare Ukhahlamba Drakensberg Park. Monk's Cowl is the access point for the Mlambonja and Mdedelo wilderness areas. The area is well known for its majestic scenery and provides hikers with a number of excellent hiking routes , which snake through the deep valleys and forests of the Northern Drakensberg eventually leading up onto the main escarpment. The routes vary in length, from a few hours to several days, and cater for hikers of all levels of fitness. Overnight hiking must be booked in advance. The area features a campsite which accommodates ninety people in a variety of camping and caravan sites. Each spacious campsite has its own barbecue facility with firewood available. The campsite is serviced by two ablution blocks, of which one has showers with hot and cold water, whilst the other has toilets only. Bot feature flush toilets, dishwashing and laundry basins. The sites are not numbered. The lower section of the campsite is reserved for 4x4 vehicles which can traverse the steep road. The mountain campsites of Keith Bush Camp and Cowl Fork campsite have no facilities and hikers must be suitably equiped. Campsites and caves are booked directly with the Camp Office. Tout en Haut is located in Bergview Estate, an access-controlled secure estate in the Champagne Valley area of the Central Drakensberg. Tout en Haut is a well appointed self catering cottage which comfortably sleeps eight. The cottage has 4 bedrooms. Cathkin Cottage is conveniently situated, opposite the Drakensberg Sun Resort, in the heart of Champagne Valley and is in close proximity to all local attractions and restaurants, with many hikes starting from the Cottage. The Drakensberg is one of the regions in the country where every little bend in the road guarantees a new surprise. Monks Cowl Nature Reserve Information and Nearby Accommodation.